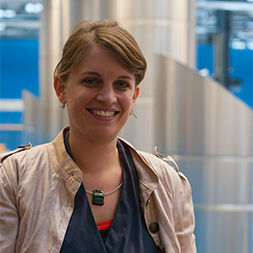 Willemijn Elkhuizen is a PhD candidate at Delft University of Technology, the Netherlands. She obtained her Bachelor and Master degree at Industrial Design Engineering in Delft. Her master in Strategic Product Design was focused on sustainable product development. From 2011 she worked at the research department of Océ Technologies, researching sustainable product development opportunities for the print industry. In 2013 Océ offered her the opportunity do a PhD focused on 3D printing and Fine Art Reproduction, which she is currently conducting. Her research focuses on the reproduction of material appearance of Fine Art; to reproduce the visual characteristics of paintings including colour, texture, and gloss. The ultimate design goal of the research project is to be able to create visually indistinguishable reproductions. In 2013 Willemijn evaluated 3D reproductions with fine art experts of three famous Dutch paintings:Selfportrait (1669) by Rembrandt, Jewish Bride (c. 1665 - c. 1669) by Rembrandt and Flower in a Blue Vase (1887) by Van Gogh. In 2015 Willemijn collaborated in creating a reconstruction of the original size of the painting Saul and David by Rembrandt, which was on show in a temporary exhibition at the Mauritshuis, in conjunction with the painting. Current research focuses on the reproduction of gloss: to understand which parameters are important for the reproduction of gloss of Fine Art artefacts, using (3D) scanning, modelling and 3D printing technologies, and how these parameters relate to the material appearance. For this propose she develops experimental setups to capture gloss – that varies across a surface - and collaborates with industry partners to print this gloss data. Besides this she conducts experiments to create a better understanding of how people perceive gloss, and how this can play a role in developing an effective gloss reproduction system. The 3D Fine Art Reproduction research project is a collaboration between Delft University of Technology; Design Engineering (IDE) and Materials in Art & Archaeology (3mE), Océ Technologies and several museums.